Lithograph in colors, printed by Cornille & Serre Imp., Paris, France circa 1922. Condition: Fine (B+) Restored loss upper right corner, backed on linen. 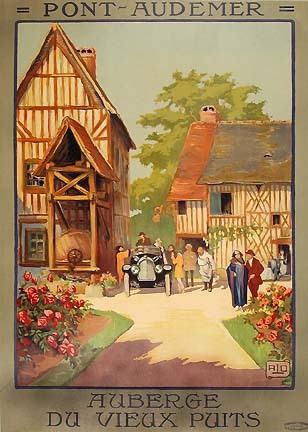 In this French travel poster designed by Alo (Charles Halo) we see a 1920s touring car entering the flowering courtyard of the Auberge du Vieux Puits in the Normandy town of Pont-Audemer. The courtyard is filled with the inn's guests fashionably dressed in Art Deco garb as the chef welcomes the new arrivals. The 17th century half-timbered buildings of the Auberge are some of the oldest in Pont-Audemer and share in the town's history as a former tannery town. On the left we see the old well (vieux puits) which locals will tell you was the inspiration for Flaubert's literary masterpiece, "Madame Bovary". The poster was published in 1922 and coincides with the completion of the inn's renovation and modernization project. The Auberge continued to flourish throughout the 20th century. Its starred restaurant was well-known throughout Normandy and beyond the borders of France. In a NY Times Review of the inn, Frederick Turner reports on its Norman cuisine describing his meal of foie gras, wild boar, and chestnut pancakes. Turner concludes his meal with a glass of Calvados, the fine apple brandy that the region is noted for. Sadly, the famed inn closed its doors in 2001. This is the only travel poster I have ever found published by a small inn. Early travel posters were generally produced by the railroads to entice you to use their services to visit the featured destinations. Occasionally you will find a municipality publishing a travel poster to promote local tourism, and, every once in a while you will run across a poster published by an important hotelier. From this perspective, this poster is a unique find.